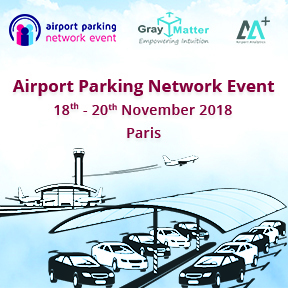 GrayMatter is attending the 10th Airport Parking Network Event (APNE 2018) which will take place at Charles de Gaulle Airport, Paris, France from 18th – 20th November 2018. With 20 hours of networking time, including an exclusive networking lunch and dinner, organized tours, discussions and interactive workshops, APNE is one of the most comprehensive and exclusive events for airport parking managers and Business Members of Parking Network. You can meet GrayMatter’s experts at the event and know more about how GrayMatter’s Car Park Revenue Management (CPRM) serves as a demand-driven dynamic car park pricing & analytics system predicting optimal future pricing and also provisioning critical data-driven insights to maximize revenues and management control.